本发明公开了将含有0.01～35摩尔%具有式(1)表示的哌啶骨架的单体或其聚合物的混合物在210℃以下的温度进行聚合的聚合物的制造方法、以及它的成型体。 The present invention discloses a method for producing a monomer mixture containing a piperidine skeleton represented 0.01 to 35 mol% of formula (1) or a polymer polymerized at a temperature of 210 deg.] C polymer and its molded . (R1表示氢原子或甲基，X表示氧原子、亚氨基、或特定的含氧原子的烃基，R2和R3表示氢原子、C1～C8的直链型烷基、C1～C8的支链型烷基、C6～C8的脂环式烃或芳基，R2和R3形成或不形成环结构)。 (R1 represents a hydrogen atom or a methyl group, X represents an oxygen atom, a hydrocarbon group having an imino group, an oxygen atom or specific, R2 and R3 represent a hydrogen atom, a linear alkyl group of C1 ~ C8, C1 ~ C8 branched chain alkyl, C6 ~ C8 alicyclic hydrocarbon or aryl group, R2 and R3 or may not form a ring structure). 本发明涉及将含有具有哌啶骨架的单体或其聚合物的混合物聚合来制造聚合物的方法、以及由该方法得到的成型体。  The present invention relates to a mixture containing a monomer having a piperidine skeleton, a polymer or a polymerization process producing a polymer, and a molded body obtained by this method. 近年，从设备的维持费降低、环境负荷降低的观点来看，强烈需要在室外等的严酷环境下使用的高分子材料的耐候性提高。  In recent years, to reduce the maintenance costs of the device, the viewpoint of reducing environmental load, a strong need to improve the weather resistance of polymer materials for use in harsh environments such as outdoors. 出于提高作为涂料使用的高分子材料的耐候性的目的，在专利文献1中，提出了将具有哌啶骨架的受阻胺型光稳定剂（以下，称为"HALS"）中、特别是氮原子上被各种0R 基取代的化合物（以下，称为"N0R-HALS"）添加到涂料成分中。  For the purpose of improving the coating as a polymer material used in weather resistance, in Patent Document 1, proposed a hindered amine light stabilizer having a piperidine skeleton (hereinafter referred to as "HALS"), the in particular the compounds of various 0R group substituted on the nitrogen atom (hereinafter referred to as "N0R-HALS") is added to the coating composition. 尽管N0R-HALS具有提高高分子材料的耐候性的效果，但存在因移动或挥发而从高分子材料中缓慢失去、该效果经时下降的问题。 Although N0R-HALS having the effect of improving the weather resistance of a polymer material, but due to the presence of volatile moving slowly or is lost from the polymer material, the effect is the problem of decrease with time. 以解决该问题为目的，在专利文献2中，提出了将分子内具有乙烯基的聚合性的N0R-HALS(以下，称为"聚合性N0R-HALS"）进行共聚，添加到涂料成分中。  The object is to resolve the problem, Patent Document 2 proposes having a polymerizable vinyl N0R-HALS (hereinafter referred to as "polymerizable N0R-HALS") are copolymerized, the molecule added to the coating components. 专利文献2中，虽然提出了将聚合性N0R-HALS的共聚物添加到涂料成分中，但没有显示将聚合性N0R-HALS的共聚物用作成型体。  In Patent Document 2, although the proposed adding a polymerizable N0R-HALS component copolymer to the coating, but did not show a polymerizable N0R-HALS copolymer used as a molding material. 如果将聚合性N0R-HALS的共聚物用作成型体，能够提高成型体本身的耐候性，则从设备的维持费用降低、环境负荷降低的观点看具有意义。 If the polymerizable N0R-HALS copolymer used as a molding material, the maintenance can be improved weatherability itself from the molded device is reduced, environmental load reduction viewpoint meaningful. 本发明人等进行了研究，结果确认在将聚合性N0R-HALS的共聚物挤出成型或注射成型时，由于成型加工时的加热，键合在硝基氧（Nitroxide，-N0_)上的R解离，得到的成型体着色。  The present inventors studied, it was confirmed that when the polymerizable N0R-HALS copolymer extrusion or injection molding, since the heating during molding, bonded nitroxide (Nitroxide, -N0_) R on the dissociation of the obtained molded body is colored. 本发明的目的在于提供耐候性优异、其效果不经时下降，没有着色的成型体。  The object of the present invention is to provide excellent weathering resistance, the effect is not lowered, that no colored molded article. 本发明人等进行了认真研究，结果发现通过适当选择键合在硝基氧上的R、在适当的温度范围进行聚合，从而可得到耐候性优异、其效果不经时下降，没有着色的成型体。  The present inventors have conducted extensive studies, and found that by appropriate selection of R in the bonded nitroxides, polymerization at an appropriate temperature range, excellent weather resistance can be obtained, the effect does not decrease over time, there is no colored molded article. 即，本发明是一种聚合物的制造方法，在210°C以下的温度将含有下述通式（1)表示的单体（al)0. 01〜35摩尔％和以甲基丙烯酸甲酯为主成分的单体（a2)65〜99. 99摩尔％的单体混合物聚合。  That is, the present invention is a process for producing a polymer at a temperature of 210 ° C or less containing 0. 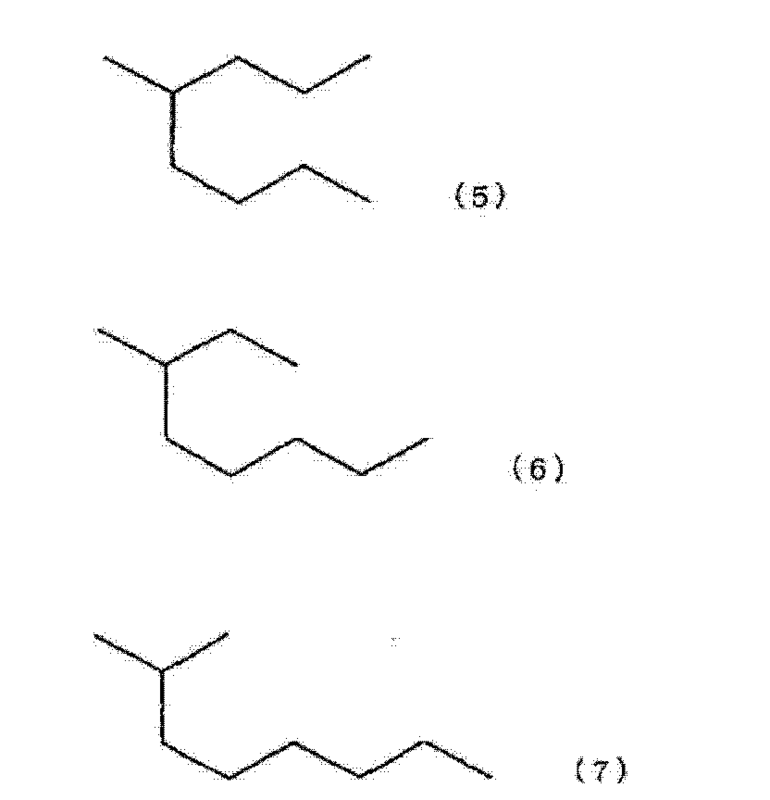 01~35 mol% of the monomer (Al) by the following formula (1) and methyl acrylate-based monomer component (a2) 65~99. 99 mol% of the monomer mixture. 另外，本发明是一种聚合物的制造方法，在210°C以下的温度将下述混合物聚合， 所述混合物含有：由以甲基丙烯酸甲酯为主成分的单体（a2)单元形成的聚合物、上述通式(1)表示的单体（al)以及以甲基丙烯酸甲酯为主成分的单体（a2)，单体（al)的含有率为0· 01〜35摩尔％。  Further, the present invention is a process for producing a polymer at a temperature below 210 ° C below the polymerization mixture, the mixture comprises: a main component methyl methacrylate monomer (a2) polymer units formed by the monomers (Al) in the general formula (1) and the monomer (a2) methyl methacrylate as a main component, a monomer (Al) content rate of 0 · 01~35 mol%. 另外，本发明是一种聚合物的制造方法，在210°C以下的温度将下述混合物聚合， 所述混合物含有：在210°C以下的温度将含有上述通式（1)表示的单体（al)和以甲基丙烯酸甲酯为主成分的单体（a2)的单体混合物聚合而得的聚合物以及以甲基丙烯酸甲酯为主成分的单体（a2)，单体（al)单元的含有率为0. 01〜35摩尔％。  Further, the present invention is a process for producing a polymer at a temperature of 210 ° C or less following the polymerization mixture, the mixture comprises: a temperature of 210 ° C or less containing the above general formula (1) monomer mixture of monomers (Al) and methyl methacrylate as a main component monomer (a2) and the polymer obtained by polymerizing methyl methacrylate as a main component monomer (a2), a single member (Al) was 0.5 units containing 01~35 mol%. 另外，本发明是在上述各方法中以浇铸聚合进行单体混合物的聚合时由该方法所得到的成型体。  Further, the present invention is a molded article obtained by the method of cast polymerization time in the polymerization of the monomer mixture in the above method. 另外，本发明是使用了上述成型体的太阳能发电模块用顶盖。  Further, the present invention is the use of solar power generation module of the molded body with the cap. 根据本发明的制造方法，可得到耐候性优异、其效果不会经时降低、没有着色的成型体。  According to the production method of the present invention, excellent weather resistance can be obtained, the effect was not reduced when the molded body is not colored. 本发明的成型体的耐候性优异、其效果不会经时降低、没有着色，适合用作太阳能发电模块用顶盖。 The molded article of the present invention is excellent in weathering resistance, was not reduced in its effect, no coloration, is suitable as a solar power generation module cover. 本发明的太阳能发电模块用顶盖即使长时间使用透射率也不会下降，不会使太阳能发电模块的发电效率降低。 The solar power generation module according to the present invention the cap even after prolonged use of the transmittance does not decrease, so does not reduce the power generation efficiency of the solar power generation module. 本发明所使用的单体（al)是聚合性N0R-HALS，用下述通式（1)表示。  The monomer used in the present invention (Al) is a polymerizable N0R-HALS, represented by the following formula (1). 通式⑴中，由于单体（al)的合成容易，所以优选X是氧原子。  Formula ⑴, since the synthetic monomer (Al) is easy, it is preferable that X is an oxygen atom. 另外，由于成型体的耐候性良好，所以优选R 2和R3是碳原子数1〜8的直链型烷基、或碳原子数1〜8的支链型烧基。 Further, since the molded body excellent weather resistance, it is preferred that R 2 and R3 1~8 carbon atoms in a linear alkyl group of 1~8 carbon atoms or a branched group burning. 作为单体（al)，例如可举出1-辛基氧-2, 2, 6, 6-四甲基-4-(甲基）丙烯酰基氧哌啶、1-辛基氧-2, 2, 6, 6-四甲基-4-(甲基）丙烯酰胺哌啶、1-丙基氧-2, 2, 6, 6-四甲基-4-(甲基）丙烯酰基氧哌啶、1-丙基氧-2, 2, 6, 6-四甲基-4-(甲基）丙烯酰胺哌啶、 1-环己基氧-2, 2, 6, 6-四甲基-4-(甲基）丙烯酰基氧哌啶、1-环己基氧-2, 2, 6, 6-四甲基-4-(甲基）丙烯酰胺哌啶、1-甲基氧-2, 2, 6, 6-四甲基-4-(甲基）丙烯酰基氧哌啶、1-甲基氧-2, 2, 6, 6-四甲基-4-(甲基）丙烯酰胺哌啶、1-辛基氧-2, 2, 6, 6-四甲基-4-(2-(2-(甲基）丙烯酰基氧）乙氧基）乙氧基哌啶、1-辛基氧-2, 2, 6, 6-四甲基-4-(4-(2-(甲基）丙烯醜基氧）乙氧基_1，4_二氧代）丁氧基哌陡。  As the monomer (Al), for example, include 1-oxo-2-octyl, 2, 6, 6-tetramethyl-4- (meth) acryloyloxy-piperidine, 1-oxo-octyl - 2, 2, 6, 6-tetramethyl-4- (meth) acrylamides piperidine, 1-propyl-oxo-2, 2, 6, 6-tetramethyl-4- (meth) acryloyloxyethyl piperidine, 1-propyl-oxo-2, 2, 6, 6-tetramethyl-4- (meth) acrylamides piperidine, 1-cyclohexyl-oxo-2, 2, 6, 6-tetramethyl - 4- (meth) acryloyloxy-piperidine, 1-cyclohexyl-oxo-2, 2, 6, 6-tetramethyl-4- (meth) acrylamides piperidine, 1-oxo-2-methyl, 2 , 6, 6-tetramethyl-4- (meth) acryloyloxy-piperidine, 1-methyl-oxo-2, 2, 6, 6-tetramethyl-4- (meth) acrylamides piperidine, 1-octyl-oxo-2, 2, 6, 6-tetramethyl-4- (2- (2- (meth) acryloyloxy) ethoxy) ethoxy piperidine, 1-oxo-octyl - 2, 2, 6, 6-tetramethyl-4- (4- (2- (meth) acryloyl ugly yloxy) ethoxy _1,4_ dioxo) piperazine butoxy steep. 它们中，由于得到的成型体的耐候性良好，所以优选1-甲基氧_2, 2, 6, 6-四甲基-4-(甲基）丙烯酰基氧哌啶、1-辛基氧-2, 2, 6, 6-四甲基-4-(甲基）丙烯酰基氧哌啶。  Among them, since the weather resistance of the obtained molded body is good, it is preferably 1-methyl-oxo _2, 2, 6, 6-tetramethyl-4- (meth) acryloyloxy-piperidine, 1- octyl-oxo-2, 2, 6, 6-tetramethyl-4- (meth) acryloyloxy-piperidine. 单体（al)可以单独使用一种也可以并用两种以上。  The monomers (Al) may be used alone or two or more may be used. 应予说明，在本发明中，（甲基）丙烯酸表示丙烯酸或甲基丙烯酸，（甲基）丙烯酰基表示丙烯酰基或甲基丙烯酰基。  Incidentally, in the present invention, (meth) acrylic acid means acrylic acid or methacrylic acid, (meth) acryloyl group represents an acryloyl group or a methacryloyl group. 单体（al)可以利用公知的方法进行合成。  monomer (Al) by a known method can be synthesized. 例如，1-辛基氧-2,2,6,6-四甲基-4-甲基丙烯酰基氧哌啶（以下，称为"单体（al-Ι)"）可如下进行合成：在钨酸钠存在下用30%双氧水对4-羟基-2, 2, 6, 6-四甲基哌啶进行氧化，使用乙酸酐对得到的4-羟基-2, 2, 6, 6-四甲基哌啶-N-氧化物进行羟基的乙酰基保护，以辛烷作为溶剂兼反应剂，利用叔丁基过氧化氢使其反应，将乙酰基保护脱保护后，与甲基丙烯酰氯反应。 For example, 1-octyloxy-2,2,6,6-tetramethyl-4-methacryloyloxy piperidine (hereinafter referred to as "monomer (al-Ι)") can be synthesized as follows: in of 4- hydroxy-2, 2, 6, 6-tetramethylpiperidine in the presence of sodium tungstate oxidized with 30% hydrogen peroxide, acetic anhydride to give 4-hydroxy-2, 2, 6, 6-tetramethyl acetyl protecting group for hydroxy piperidine -N- oxide to octane as a solvent and reactant, the use of t-butyl hydroperoxide reacted, after protection of the acetyl group deprotection, the reaction with methacryloyl chloride. 另外，单体（al-Ι)可以用特表2008-519003号公报记载的方法来合成。  Further, the monomer (al-Ι) can be synthesized by the method described in Japanese Patent Publication No. 2008-519003 is. 具体而言， 在钨酸钠二水合物的存在下，用30%双氧水溶液氧化三丙酮胺，转化为三丙酮胺-N-氧化物后，利用1-辛烯和叔丁基过氧化氢使其反应，利用Ru担载炭和氢进行还原，使得到的4-羟基-1- (1-辛基氧）-2, 2, 6, 6-四甲基哌啶和4-羟基-1- (3-辛基氧）-2, 2, 6, 6-四甲基哌啶的混合物与甲基丙烯酰氯反应，由此可以合成。 Specifically, after the presence of sodium tungstate dihydrate with 30% hydrogen peroxide solution of triacetone amine oxide, amine -N- acetone conversion into oxides, and the use of 1-octene to make t-butyl hydroperoxide reaction, using a Ru supported on carbon and hydrogen reduction, 4-hydroxy-1- (1-oxo-octyl) obtained -2, 2, 6, 6-tetramethyl piperidine and 4-hydroxy-1 (3-oxo-octyl) -2, 2, 6, 6-tetramethyl-piperidine was reacted with methacryloyl chloride, which can be synthesized. 另外，1-丙基氧-2, 2, 6, 6-四甲基-4-甲基丙烯酰基氧哌啶（以下，称为"单体(al-2) "）可以按照特表2008-519003号公报记载的方法、使用丙烯代替1-辛烯来进行合成。  Further, 1-propyl-oxo-2, 2, 6, 6-tetramethyl-4-methacryloyloxy piperidine (hereinafter referred to as "monomer (al-2)") can follow Laid methodology described in Publication No. 2008-519003, instead of 1-octene propylene be synthesized. 另外，1-辛基氧-2, 2, 6, 6-四甲基-4-(2-(2-甲基丙烯酰基氧）乙氧基）乙氧基哌啶（以下，称为"单体（al-3) "）可以如下合成：使用乙酸酐对2, 2, 6, 6-四甲基-4-(2-(2-羟基乙氧基）乙氧基哌啶-N-氧化物进行羟基的乙酰基保护，以辛烷作为溶剂兼反应剂，利用叔丁基过氧化氢进行反应，将乙酰基保护脱保护后，与甲基丙烯酰氯反应。  Further, 1-octyl-oxo-2, 2, 6, 6-tetramethyl-4- (2- (2-methacryloyloxy) ethoxy) ethoxy piperidine (hereinafter referred to as "monomer (al-3)") can be synthesized as follows: acetic anhydride 2, 2, 6, 6-tetramethyl-4- (2- (2-hydroxyethoxy) ethoxy piperidine - N- oxides acetyl protecting a hydroxyl group to octane as a solvent and reactant, the use of t-butyl hydroperoxide is reacted, after protection of the acetyl group deprotection, the reaction with methacryloyl chloride. 另外，1-辛基氧-2, 2, 6, 6-四甲基-4-(4-(2-甲基丙烯酰基氧）乙氧基-1，4-二氧代）丁氧基哌啶（以下，称为"单体（al-4)"）可以如下合成：在钨酸钠存在下，利用30%双氧水对4-羟基-2, 2, 6, 6-四甲基哌啶进行氧化，使用乙酸酐对得到的4-羟基-2, 2, 6, 6-四甲基哌啶-N-氧化物进行羟基的乙酰基保护，以辛烷作为溶剂兼反应剂，利用叔丁基过氧化氢进行反应，将乙酰基保护脱保护后，加成琥珀酸酐，使得到的羧酸与甲基丙烯酸2-羟基乙基醋脱水缩合。  Further, 1-octyl-oxo-2, 2, 6, 6-tetramethyl-4- (4- (2-acryloyloxy) ethoxy-1,4-dioxo) butyrate piperidine group (hereinafter referred to as "monomer (al-4)") can be synthesized as follows: in the presence of sodium tungstate, using 30% hydrogen peroxide solution of 4- hydroxy-2, 2, 6, 6-tetramethyl piperidine is oxidized using acetic anhydride to give 4-hydroxy-2, 2, 6, 6-tetramethylpiperidine -N- hydroxy oxides acetyl protected octane as a solvent and reactant, the use of t-butyl hydroperoxide is reacted, after protection of the acetyl group deprotection, addition of succinic anhydride, the carboxylic acid with methyl acrylate, 2-hydroxyethyl obtained dehydration condensation vinegar. 另外，1-甲基氧-2, 2, 6, 6-四甲基-4-甲基丙烯酰基氧哌啶（以下，称为"单体(al-5) "）可以按照特表2009-541428号公报记载的方法，合成1-甲基氧-2, 2, 6, 6-四甲基-4-羟基哌啶后，与甲基丙烯酰氯反应来进行合成。  Further, 1-methyl-oxo-2, 2, 6, 6-tetramethyl-4-methacryloyloxy piperidine (hereinafter referred to as "monomer (al-5)") can follow Laid after Publication No. 2009-541428 disclosed a method, the synthesis of 1-methyl-oxo-2, 2, 6, 6-tetramethyl-4-hydroxypiperidine, the reaction with methacryloyl chloride to be synthesized. 具体而言，可通过在氯化铜（I)的存在下使2, 2, 6, 6-四甲基-4-羟基哌啶-N-氧化物与丙酮和30%双氧水溶液反应，使得到的1-甲基氧-2, 2, 6, 6-四甲基-4-羟基哌啶与甲基丙烯酰氯反应而合成。 Specifically, by reacting 2, 2, 6, 6-tetramethyl-4-hydroxypiperidine -N- oxide with acetone and 30% hydrogen peroxide solution in the presence of copper (I) chloride, so obtained 1-methyl-oxo-2, 2, 6, 6-tetramethyl-4-hydroxypiperidine with methacryloyl chloride synthesized. 本发明中使用的单体（a2)以甲基丙烯酸甲酯为主成分。  The present invention is used in the monomer (a2) methyl methacrylate as a main component. 本发明中，将相对于总体为50质量％以上称为"主成分"。 In the present invention, with respect to the overall mass of less than 50% referred to as "main component." 单体（a2)含有50质量％以上甲基丙烯酸甲酯，优选含有75质量％以上，更优选含有90质量％以上。 Monomer (a2) contains at least 50% by mass of methyl methacrylate, preferably 75% by mass or more, more preferably 90 mass% or more. 其中，单体（a2)是100质量％。 Wherein the monomer (a2) is 100 mass%. 如果单体（a2) 含有50质量％以上的甲基丙烯酸甲酯，则得到的成型体的外观、机械强度和耐候性良好。 If the monomer (a2) contains at least 50 mass% methyl methacrylate, the appearance of the obtained molded article, mechanical strength and weather resistance. 单体（a2)可以含有甲基丙烯酸甲酯以外的单体。  The monomer (a2) a monomer other than methyl methacrylate may contain. 单体（a2)含有50质量％以下的甲基丙烯酸甲酯以外的单体，优选含有25质量％以下，更优选含有10质量％以下。 Monomer (a2) other than methyl methacrylate containing 50 mass% or less, preferably 25 mass% or less, more preferably 10% by mass or less. 如果单体（a2)含有50质量以下的甲基丙烯酸甲酯以外的单体，则得到的成型体的外观、机械强度和耐候性良好。 If the monomer (a2) containing a monomer other than methyl methacrylate 50 mass or less, the appearance of the obtained molded article, mechanical strength and weather resistance. 作为单体（a2)含有的甲基丙烯酸甲酯以外的单体，例如可举出丙烯酸甲基酯、 (甲基）丙烯酸乙基酯、（甲基）丙烯酸环己基酯、（甲基）丙烯酸异冰片基酯、（甲基）丙烯酸苯基酯、（甲基）丙烯酸苄基酯等（甲基）丙烯酸酯；苯乙烯、α -甲基苯乙烯等芳香族乙烯基单体；乙烯基三甲氧基硅烷等含硅单体；马来酸酐、马来酸、马来酸单烷基酯等马来酸系单体；富马酸、富马酸单烷基酯等富马酸系单体；马来酰亚胺、Ν-甲基马来酰亚胺等马来酰亚胺系单体；（甲基）丙烯腈等氰化乙烯基单体；乙二醇二（甲基）丙烯酸酯、二乙烯基苯等交联性单体。  As the monomer (a2) a monomer other than methyl methacrylate contained, for example, include methyl acrylate, (meth) acrylate, (meth) acrylate, cyclohexyl acrylate, (meth yl) acrylate, isobornyl (meth) acrylate, phenyl (meth) acrylate, benzyl (meth) acrylate; styrene, α - methylstyrene, aromatic vinyl monomers; silicon-containing vinyl trimethoxysilane monomer; maleic acid-based monomers such as maleic anhydride, maleic acid, maleic acid monoalkyl esters; fumaric acid, fumaric acid monoalkyl esters and the like monomers; maleimide, Ν- methyl maleimide and the like maleimide monomers; (meth) acrylonitrile, vinyl cyanide monomers; ethylene glycol di (meth ) acrylate, divinylbenzene crosslinkable monomer. 它们可以单独使用1种也可以并用2种以上。 These may be used singly or two or more may be used in combination. 它们中，由于得到的成型体的外观、机械强度和耐候性良好，所以优选苯乙烯等芳香族乙烯基单体、氰化乙烯基单体。 Among them, since the appearance of the molded body obtained, the mechanical strength and weather resistance, it is preferably an aromatic vinyl monomer such as styrene, vinyl cyanide monomers. 本发明的聚合物可以用以下的3种方法制造。  The polymers of the present invention can be produced by the following three methods. 方法1 :在210°C以下的温度将含有单体（al) 0. 01〜35摩尔％和单体（a2) 65〜 99. 99摩尔％的单体混合物进行聚合。  Method 1: temperature of 210 ° C or less containing the monomer (al) 0. 01~35 65~ 99. 99% mol% mol monomer mixture and the monomer (a2) polymerization. 方法2 :在210°C以下的温度将含有由单体（a2)单元形成的聚合物、单体（al)和单体（a2)且单体（al)的含有率是0. 01〜35摩尔％的混合物进行聚合。  Method 2: temperature of 210 ° C or less containing the polymer, the monomer (Al) and the monomer (a2) and monomer (Al) is formed by the content of the monomer (a2) unit is 0. 01~35 mol% of the polymerization mixture. 方法3 :在210°C以下的温度将含有单体（al)和单体（a2)的单体混合物进行聚合而得到聚合物，在210°C以下的温度将含有该聚合物和单体（a2)且单体（al)单元的含有率是0. 01〜35摩尔％的混合物进行聚合。  Method 3: temperature of 210 ° C or less a monomer mixture containing the monomers (Al) and the monomer (a2) is carried out to obtain a polymer, at a temperature of 210 ° C or less and containing the polymer monomer (a2) and monomer (Al) content of the unit is a 0. 01~35 mol% of the polymerization mixture. 以下，说明方法1。  Next, a method 1. 方法1中使用的单体混合物含有单体（al)0. 01〜35摩尔％和单体（a2)65〜 99. 99摩尔％。 The monomer mixture  Method 1 was used containing 65~ 99.99 mol% of the monomer (al) 0. 01~35 mol% and the monomer (a2). 其中，单体混合物是100摩尔％。 Wherein, the monomer mixture was 100 mol%. 单体混合物优选含有单体（al) 0. 03〜1摩尔％和单体（a2) 99〜99. 97摩尔％。 Monomer mixture comprising 99~99 preferably 97 mol% mol% monomer (a2) a monomer (al) 0. 03~1. 如果单体混合物中的单体（al)的含有率是0. 01摩尔％以上，则可充分体现耐候性的提高效果，如果是35摩尔％以下，则得到的成型体的外观和机械强度良好。 If the monomer mixture of monomers (Al) content of not less than 0.01 mol%, can fully reflect the effect of improving the weather resistance, and if it is 35 mol% or less, good appearance and mechanical strength of the obtained molded body . 单体混合物在210°C以下的温度进行聚合。  The monomer mixture was polymerized at a temperature of 210 ° C or less. 应予说明，本发明中，将聚合工序的最高处理温度称为"聚合温度"。 Incidentally, in the present invention, the maximum processing temperature of the polymerization step is referred to as "polymerization temperature." 聚合温度优选在40〜210°C的范围，更优选110〜210°C的范围，特别优选110〜180°C的范围。 The polymerization temperature is preferably in the range of 40~210 ° C, more preferably 110~210 ° C, and particularly preferably of 110~180 ° C. 另外，特别优选在第1步为40〜90°C、第2步为100〜 140°C的2步聚合温度进行聚合。 Further, particularly preferably in step 1 of 40~90 ° C, the second step of 100~ 140 ° C polymerization temperature in the polymerization step 2. 如果聚合温度在210°C以下，则单体（al)的键合于硝基氧上的R在聚合时不会解离，得到的成型体不会着色。 If the polymerization temperature is in the key 210 ° C or less, the monomer (Al) is bonded to the nitroxide R does not dissociate during the polymerization, the resulting molded product is not colored. 另外，如果聚合温度在40°C以上，则可提高使用的单体的聚合添加率。 Further, if the polymerization temperature is above 40 ° C, it can be used to improve the polymerization of the monomer addition rate. 作为单体混合物的聚合方法，例如可举出溶液聚合、悬浮聚合、乳液聚合、浇铸聚合。  The polymerization method of the monomer mixture include, for example, solution polymerization, suspension polymerization, emulsion polymerization, cast polymerization. 它们中，由于可直接得到成型体，所以优选浇铸聚合。 Among them, since the molded body can be obtained directly, it is preferably cast polymerization. 如果是浇铸聚合，则不需要像注射成型、挤出成型等一样在制造成型体的工序中再次加热，可以没有着色地制造使用了单体（al)的成型体。 If cast polymerization, it is not necessary as injection molding, extrusion molding or the like as in the manufacturing process of the molded body is heated again, no coloration can be manufactured using the molded body monomer (Al) is. 以下，说明方法2。  Next, a method 2. 方法2中，首先，将由单体（a2)单元形成的聚合物与另外准备的单体（al)和单体(a2)混合，得到混合物。  In the method 2, first, a polymer containing a monomer unit (a2) forming the monomer (Al) separately prepared (a2) and the monomer mixture, to obtain a mixture. 方法2中使用的聚合物是将单体（a2)聚合而得到的。 Method 2 is used in the polymer of the monomer (a2) obtained by polymerizing. 单体（a2) 的聚合方法没有特别限定，可以使用公知的聚合方法。 Polymerizing a monomer (a2) is not particularly limited, and a known polymerization method may be used. 混合物中的聚合物与单体（al + a2)的比例优选是聚合物0. 1〜80质量％和单体（al + a2) 20〜99. 9质量％。  The proportion of polymer in the monomer mixture (al + a2) is preferably 0. 1~80 mass% of the polymer and the monomer (al + a2) 20~99. 9% by mass. 其中，混合物是100质量％。 Wherein the mixture is 100% by mass. 混合物更优选含有聚合物1〜 50质量％和单体（al + a2) 50〜99质量％。 More preferably a mixture comprising 1 ~ 50% by mass of the polymer and the monomer (al + a2) 50~99% by mass. 如果混合物中的聚合物的含有率是0. 1〜80 质量％的范围，则可以将混合物的粘度调整到作业性良好的范围。 If the content of the polymer mixture is in the range of 0. 1~80% by mass, the viscosity of the mixture may be adjusted to a range of good workability. 另外，可以抑制伴随聚合的进行的成型体的体积收缩。 Further, the polymerization can be suppressed along with the volume of molded body was contraction. 混合物中，单体（al)的含有率是0.01〜35摩尔％，其它成分的含有率是65〜 99. 99摩尔％。  The mixture of monomer (Al) content rate is 0.01~35% by mole, the content of the other components is 65~ 99.99 mol%. 其中，混合物中的单体的总摩尔数与构成聚合物的单体单元的总摩尔数的合计是100摩尔％。 Wherein the total moles of monomer mixture with the monomer units constituting the polymer to the total moles of the total of 100 mol%. 混合物优选含有单体（al) 0. 03〜1摩尔％和其它成分99〜99. 97摩尔％。 99~99 mixture preferably contains 97 mol% 0.5 mol% 03~1 monomer and other ingredients (Al). 如果混合物中的单体（al)的含有率是0.01摩尔％以上，则可以充分体现耐候性的提高效果，如果是35摩尔％以下，则得到的成型体的外观和机械强度良好。 If a mixture of monomers (Al) content of not less than 0.01 mol%, it is possible to fully reflect the effect of improving the weather resistance, and if it is 35 mol% or less, good appearance and mechanical strength of the obtained molded body. 得到的混合物在210°C以下的温度进行聚合。  The obtained mixture at a temperature of 210 ° C or less polymerization. 聚合温度的规定与方法1所示的单体混合物的聚合温度相同。 Predetermined polymerization temperature and the polymerization temperature of the monomer mixture is the same as shown in FIG. 1. 作为混合物的聚合方法，例如可举出溶液聚合、悬浮聚合、浇铸聚合。 The polymerization method of mixture include, for example, solution polymerization, suspension polymerization, cast polymerization. 它们中，由于可直接得到成型体，所以优选浇铸聚合。 Among them, since the molded body can be obtained directly, it is preferably cast polymerization. 以下，说明方法3。  Next, a method 3. 方法3中，首先，将在210°C以下的温度聚合含有单体（al)和单体（a2)的单体混合物而得到的聚合物与另外准备的单体（a2)混合，得到混合物。  Method 3, first, the temperature was 210 ° C or less polymerizable monomer mixture containing monomer (Al) and the monomer (a2) is obtained by separately prepared polymer and a monomer (a2) mixing, to obtain a mixture. 单体混合物在210°C以下的温度进行聚合。  polymerizing the monomer mixture at a temperature of 210 ° C or less. 聚合温度的规定与方法1所示的单体混合物的聚合温度相同。 Predetermined polymerization temperature and the polymerization temperature of the monomer mixture is the same as shown in FIG. 1. 聚合方法没有特别限定。 The polymerization method is not particularly limited. 混合物中的聚合物与单体（a2)的比例优选是聚合物0. 1〜80质量％和单体(a2) 20〜99. 9质量％。  The proportion of polymer in the monomer mixture (a2) is preferably a polymer 0. 1~80% by mass and the monomer (a2) 20~99. 9% by mass. 其中，混合物是100质量％。 Wherein the mixture is 100% by mass. 混合物更优选含有聚合物1〜50质量％和单体（a2) 50〜99质量％。 More preferably a mixture comprising 50~99 1~50 mass% mass of the polymer and the monomer (a2)%. 如果混合物中的聚合物的含有率是0. 1〜80质量％的范围，则可将混合物的粘度调整到作业性良好的范围。 If the content of the polymer mixture is in the range of 0. 1~80% by mass, the viscosity of the mixture can be adjusted to a range of good workability. 另外，可以抑制与聚合的进行相伴的成型体的体积收缩。 Further, the volume can be suppressed and polymerization proceeds accompanying shrinkage of the molded body. 混合物也可根据需要含有由单体（a2)单元形成的聚合物。  The mixture may also contain a polymer formed from a monomer unit (a2) as necessary. 混合物的单体（al)单元的含有率是0. 01〜35摩尔％，其它成分的含有率是65〜 99. 99摩尔％。  The monomer mixture (Al) content of the unit is a 0. 01~35 mol%, the content of the other components is 65~ 99.99 mol%. 其中，混合物中的单体的总摩尔数与构成聚合物的单体单元的总摩尔数的合计是100摩尔％。 Wherein the total moles of monomer mixture with the monomer units constituting the polymer to the total moles of the total of 100 mol%. 混合物优选含有单体（al)单元0. 03〜1摩尔％和其它成分99〜99. 97 摩尔％。 99~99 mixture preferably contains 97 mol% mol% monomer and other ingredients (Al) unit 0. 03~1. 如果混合物中的单体（al)单元的含有率是0. 01摩尔％以上，则可充分体现耐候性的提高效果，如果是35摩尔％以下，则得到的成型体的外观和机械强度良好。 If the content of the monomer mixture (Al) element is not less than 0.01 mol%, it can fully reflect the effect of improving the weather resistance, and if it is 35 mol% or less, good appearance and mechanical strength of the obtained molded body. 对于浇铸聚合的方法，进行具体记述。  For the method of cast polymerization, will be specifically described. 浇铸聚合是在单体混合物中添加聚合引发剂等后在模内聚合。 Cast polymerization is a polymerization initiator is added after the polymerization in a mold or the like in the monomer mixture. 如方法2和3所述，可以代替单体混合物而使用聚合物和单体的混合物。 The method as described in 2 and 3, can be used instead of the monomer mixture of polymer and monomer mixture. 作为在模内进行浇铸聚合时的聚合方法，例如可举出自由基聚合、阴离子聚合，优选自由基聚合。  As a polymerization method when carried out in the die casting polymerization, and examples thereof include radical polymerization, anionic polymerization, radical polymerization is preferable. 作为自由基聚合引发剂，例如可举出过氧化苯甲酰、过氧化二叔丁基、叔己基过氧化特戊酸酯、叔己基过氧化异丙基碳酸酯等有机过氧化物；2, 2' -偶氮双异丁腈、 2, 2' -偶氮双-2, 4-二甲基戊臆、2, 2' -偶氮双（4-甲氧基-2, 4-二甲基戊臆）、2, 2' -偶氮双-2-甲基丁腈等偶氮系引发剂。 As the radical polymerization initiator, and examples thereof include benzoyl peroxide, tert-butyl peroxide, t-hexyl peroxy pivalate, t-hexyl peroxy isopropyl carbonate and the like organic peroxides; 2, 2 '- azobisisobutyronitrile, 2, 2' - azobis-2,4-dimethyl-pentyl chest, 2, 2 '- azobis (4-methoxy-2,4-dimethyl pentyl addiction), 2, 2 '- azobis-2-methylbutyronitrile and the like azo initiator. 自由基聚合引发剂中，由于操作性优异，所以优选过氧化苯甲酰、2, 2' -偶氮双异丁腈、2, 2' -偶氮双-2, 4-二甲基戊腈、叔己基过氧化特戊酸酯。 A radical polymerization initiator, since the workability is excellent, it is preferably benzoyl peroxide, 2, 2 '- azobisisobutyronitrile, 2, 2' - azobis-2,4-dimethylvaleronitrile , t-hexyl peroxy pivalate. 自由基聚合引发剂的使用量优选相对于单体100摩尔为0. 001〜1摩尔，更优选0· 01〜1摩尔。  The amount of the radical polymerization initiator used is preferably 100 mol of the monomer 001~1 0.5 moles, more preferably 0.5 mol 01~1. 在浇铸聚合时，为了调节得到的成型体的分子量，可以使用硫醇等链转移剂。  When casting polymerization, in order to adjust the molecular weight of the obtained molded body may be used a chain transfer agent such as mercaptan. 另夕卜，浇铸聚合优选在不存在氧的环境进行。 Another Bu Xi, cast polymerization is preferably carried out in the absence of an oxygen atmosphere. 浇铸聚合时，可以配合紫外线吸收剂、光稳定剂、抗氧化剂、抗静电剂、抗菌剂、阻燃剂、耐冲击改性剂、光扩散剂、链转移剂、填充剂、强化剂等添加剂。  When casting polymerization may be blended ultraviolet absorbers, light stabilizers, antioxidants, antistatic agents, antibacterial agents, flame retardants, impact modifiers, light diffusing agent, chain transfer agents, fillers, reinforcing and other additives. 添加剂的配合量根据用途而不同，优选相对于整体为5质量％以下。 With the amount of the additive depending on the use, but is preferably 5 with respect to the whole mass% or less. 如果添加剂的配合量在5质量％以下，则得到的成型体的玻璃化转变温度的降低减小，成型体的耐热性良好。 If the additive amount of the molded body 5 mass% or less, the resulting decrease in glass transition temperature is reduced, good heat resistance of the molded body. 作为紫外线吸收剂和光稳定剂，可举出以下化合物。  As the ultraviolet absorber and the light stabilizer include the following compounds. 2_(2'_羟基苯基）苯并三唑类。  2_ (2'_ hydroxyphenyl) benzotriazoles. 例如，5'甲基-衍生物（Ciba · Japan(株）制TV-P)、3'，5' -二叔丁基_、5' -叔丁基_、5' - (1，1，3, 3_ 四甲基丁基）_、5_ 氣_3'，5' -二叔丁基_、5_氯-3' -叔丁基-5' -甲基、3' -仲丁基-5' -叔丁基、4' -辛氧基_、3'，5' -二叔戊基-、3'，5' -双（α，α -二甲基节基）-、3' -叔丁基_5' _2_ (ω -轻基-八（亚乙基氧）-撰基乙基）-、3' -十_烧基_5' -甲基-、3'-叔丁基-5' -(2-半基氧撰基）-乙基、十_烧基化-5'-甲基-衍生物。 For example, 5 'methyl - derivative (Ciba · Japan (K.K.) TV-P), 3', 5 '- di-tert-_, 5' - _ t-butyl, 5 '- (1,1, 3, 3_ tetramethylbutyl) _, 5_ gas _3 ', 5' - di-tert-_, 5_-chloro-3 '- tert-butyl-5' - methyl-3 '- sec - 5 '- tert-butyl-4' - _ octoxy, 3 ', 5' - di-t-amyl -, 3 ', 5' - bis (α, α - dimethyl section yl) -, 3 '- tert-butyl _5 '_2_ (ω - light-yl - octa (ethyleneoxy) - essays yl ethyl) -, 3' - ten-yl _5 _ burn '- methyl -, 3'-tert-butyl - 5 '- (2-yloxy essays semi-yl) - ethyl, groups of ten _ burn-5'-methyl - derivative. 2-羟基-二苯甲酮类。  2-Hydroxy - benzophenones. 例如，4-羟基_、4_甲氧基_、4_辛氧基_、4_癸基氧_、 4_十二烷基氧_、4_苄基氧_、4, 2'，4' -三羟基_、2' -羟基-4, 4' -二甲氧基衍生物。 For example, 4-hydroxy-_, _ 4_ methoxy, octyloxy 4_ _, _ 4_ oxygen decyl, dodecyl oxygen 4_ _, _ 4_ benzyloxy, 4, 2 ', 4 '- trihydroxy _, 2' - hydroxy - 4, 4 '- dimethoxy derivatives. 立体位阻性胺类。  The sterically hindered amines property. 例如，癸二酸双（2, 2, 6, 6-四甲基-4-哌啶基）（（株）ADEKA制1^770)、癸二酸双（1，2,2,6,6-五甲基-4-哌啶基）（(：让&.如?&11(株）制17-292)、双（1-辛基氧-2,2,6,6-五甲基-4-哌啶基）癸二酸酯（(：让&*如?&11(株）制17-123)、2,4-双[^丁基-Ν- (1-环己基氧-2, 2, 6, 6-四甲基哌啶-4-基）氨基]-6- (2-羟基乙基胺）-1，3, 5-三嗪（Ciba · Japan(株）制TV-152)、双（1，2, 2, 6, 6-五甲基哌啶基）正丁基-3, 5-二叔丁基-4-羟基苄基丙二酸酯、1-羟基乙基-2, 2, 6, 6-四甲基-4-羟基哌啶与琥珀酸的缩合生成物、Ν，Ν' -双（2, 2, 6, 6-四甲基哌啶基）六亚甲基二胺与4-叔辛基氨基-2, 6-二氯-均三嗪的缩合生成物、三（2, 2, 6, 6-四甲基-4-哌啶基）次氮基三乙酸酯、四（2, 2, 6, 6-四甲基-4-哌啶基）-1，2,3,4_ 丁烷四羧酸、1，1'-(1，2-乙烷二基）-双（3,3,5,5_四甲基哌嗪酮）。 For example, sebacic acid, bis (2, 2, 6, 6-tetramethyl-4-piperidyl) ((Ltd.) 1 ^ 770 manufactured by ADEKA), sebacic acid bis (1,2,2,6,6 - pentamethyl-4-piperidyl) ((: 11 & let & such (Ltd.) 17-292.? ), bis (1-octyloxy-2,2,6,6-pentamethyl -4 - piperidyl) sebacate ((: let & * 11 & such (Ltd.) 17-123? ), 2,4-bis [^ butyl -Ν- (1- cyclohexyl-oxo-2, 2, 6, 6-tetramethyl-piperidin-4-yl) amino] -6- (2-hydroxyethylamine) -1,3,5-triazine (Ciba · Japan (K.K.) TV-152), bis (1,2, 2, 6, 6-pentamethyl-piperidyl) n-butyl-3, 5-di-tert-butyl-4-hydroxybenzyl malonate, 1-hydroxy-ethyl-2, 2 , 6, 6-tetramethyl-4-hydroxypiperidine and succinic acid, condensation product, Ν, Ν '- bis (2, 2, 6, 6-tetramethyl-piperidyl) hexamethylenediamine and 4-tert-octyl-amino-2,6-dichloro - s-triazine condensation product, tris (2, 2, 6, 6-tetramethyl-4-piperidyl) nitrilo triacetate , tetrakis (2, 2, 6, 6-tetramethyl-4-piperidyl) -1,2,3,4_ butane tetracarboxylic acid, 1,1 '- (1,2-ethanediyl) - bis (3,3,5,5_ tetramethyl piperazinone). 羟基苯基-均三嗪类。  hydroxyphenyl - triazines. 例如，2, 6-双-(2, 4-二甲基苯基）-4-(2-羟基-4-辛基氧苯基）-均三嗪、2, 6-双-(2, 4-二甲基苯基）-4- (2, 4-二羟基苯基）-均三嗪、 2, 4-双-(2, 4-二羟基苯基）-6- (4-氯苯基）-均三嗪、2, 4-双-〔2-羟基-4- (2-羟基乙氧基）苯基〕-6-(4-氯苯基）-均三嗪、2, 4-双-〔2-羟基-4-(2-羟基乙氧基）苯基〕-6-苯基-均三嗪、2, 4-双-〔2-羟基-4-(2-羟基乙氧基）苯基〕-6-(2,4-二甲基苯基）-均三嗪、2, 4-双-〔2-羟基-4-(2-羟基乙氧基）苯基〕-6-(4-溴苯基）-均三嗪、2,4_双-〔 2-羟基-4-(2-乙酰氧基乙氧基）苯基〕-6-(4-氯苯基）-均三嗪、2, 4-双（2, 4-二羟基苯基）-6- (2, 4-二甲基苯基）-均三嗪。 For example, 2,6-bis - (2,4-dimethylphenyl) -4- (2-hydroxy-4-oxo-octyl-phenyl) - s-triazine, 2,6-bis - (2, 4 - dimethylphenyl) -4- (2, 4-hydroxyphenyl) - s-triazine, 2,4-bis - (2, 4-dihydroxyphenyl) -6- (4-chlorophenyl ) - s-triazine, 2,4-bis - [2-hydroxy-4- (2-hydroxyethoxy) phenyl] -6- (4-chlorophenyl) - s-triazine, 2,4-bis - [2-hydroxy-4- (2-hydroxyethoxy) phenyl] -6-phenyl - triazine, 2, 4-bis - [2-hydroxy-4- (2-hydroxyethoxy) phenyl] -6- (2,4-dimethylphenyl) - s-triazine, 2,4-bis - [2-hydroxy-4- (2-hydroxyethoxy) phenyl] -6- ( 4-bromophenyl) - triazine, 2,4_ bis - [2-hydroxy-4- (2-acetoxyethoxy) phenyl] -6- (4-chlorophenyl) - mesitylene piperazine, 2,4-bis (2,4-dihydroxyphenyl) -6- (2,4-dimethylphenyl) - s-triazine. 其它，2-羟基-二苯甲酮衍生物、镍化合物、草酰二胺类。  Other, 2-hydroxy - benzophenone derivatives, nickel compounds, oxalyl diamines. 作为抗氧化剂，可举出以下化合物。  Examples of the antioxidant include the following compounds. 烷基化单酚类。  alkylated monophenols. 例如，2, 6-二叔丁基-4-甲基苯酚、2-叔丁基-4, 6-二甲基苯酚、 2, 6_二叔丁基_4_乙基苯酌·、2, 6_二叔丁基_4_正丁基苯酌·、2, 6_二叔丁基_4_异丁基苯酚、2, 6-二环戊基-4-甲基苯酚、2-( α -甲基环己基）-4, 6-二甲基苯酚、2, 6-二（十八烷基）-4-甲基苯酚、2, 4, 6-三环己基苯酚、2, 6-二叔丁基-4-甲氧基甲基苯酚。 For example, 2,6-di-t-butyl-4-methylphenol, 2-tert-butyl-4,6-dimethylphenol, 2-tert-butyl _4_ 6_ discretion · ethylbenzene, 2 , di-t-butyl _4_ 6_ discretion · n-butylbenzene, 2, 6_ _4_ isobutyl-di-tert-butylphenol, 2,6-dicyclopentyl-4-methylphenol, 2- (α - methylcyclohexyl) -4,6-dimethylphenol, 2,6-di (octadecyl) -4-methylphenol, 2, 4, 6-tricyclohexylphenol, 2,6, 2, 6 - di-tert-butyl-4-methylphenol. 烷基化氢醌类。  alkylated hydroquinones. 例如，2, 6-二叔丁基-4-甲氧基苯酚、2, 5-二叔丁基氢醌、2, 5-二叔戊基氢醌、2, 6-二苯基-4-十八烧基氧苯酚。 For example, 2,6-di-t-butyl-4-methoxyphenol, 2,5-di-t-butylhydroquinone, 2, 5-di-t-amyl hydroquinone, 2,6-diphenyl-4-octadecyloxy burn-yloxy phenol. 其它的羟基化二硫苯基醚类、亚烷基双酚类、苄基化合物、酰基氨基酚类。  Other hydroxylated disulfide, diphenyl ethers, alkylidene bisphenols, benzyl compounds, acylamino phenols. 作为模，例如可举出由强化玻璃、镀锌板、不锈钢板等板状体和软质氯乙烯等密封垫构成的构件；由相对且以同一速度向同一方向运行的2片环形带和在环形带的相对的面侧的两端部以与环形带相同速度运行的密封垫构成的构件。  as a template, for example, include a member made of reinforced glass, galvanized plate, stainless steel plate-like member and a soft gasket made of vinyl chloride and the like; manufactured by two annular opposed and run in the same direction at the same speed and both end portions with the opposite side of the surface of the endless belt to seal the same speed as the endless belt running configuration of the pad member. 浇铸聚合后，从模中取出得到的成型体时的温度（以下称为"剥离温度"）优选是70〜110°C的范围。  After casting the polymerization, the temperature of the molded body was taken out from the mold (hereinafter referred to as "release temperature") is preferably in the range of 70~110 ° C. 剥离温度的下限值更优选75°C以上，进一步优选80°C以上。 Release lower limit temperature or more and more preferably 75 ° C, more preferably above 80 ° C. 如果剥离温度是70°C以上，则从模中取出成型体时，表面很难带伤。 If the temperature is above the peeling 70 ° C, removed from the mold when molded, hard surface wounding. 另外，如果剥离温度在110°C以下，则成型体表面不会产生条纹状的缺陷。 Further, if the release temperature is below 110 ° C, the surface of the molded body does not produce striped defects. 当成型体为板状物时，其厚度优选是0. 5〜15mm的范围内。  When the plate is molded, the thickness is preferably in the range of 0. 5~15mm. 优选成型体由数均分子量为1000〜100万的聚合物构成，更优选由数均分子量为2000〜50万的聚合物构成。  The molded article is preferably a number average molecular weight of the polymer constituting 1000~100 Wan, more preferably a number average molecular weight of the polymer constituting 2000~50 Wan. 如果构成成型体的聚合物的数均分子量在1000以上，则可抑制聚合物的挥发。 If the number of the molded body constituting the polymer average molecular weight of 1,000 or more, volatilization of the polymer is suppressed. 由于本发明的成型体具有高耐候性，所以作为建材等、室外使用的物品有用，尤其作为太阳能发电模块用顶盖有用。  Since the molded article of the present invention has high weather resistance, it is useful as building materials, articles for outdoor use, particularly useful as a solar power generation module cover. 用于覆盖太阳能发电模块的最表面（受光面侧）的顶盖的材料主流是玻璃板和透明树脂板。 Most major surface (light receiving surface side) of the top cover  to cover the solar photovoltaic module material is glass and the transparent resin plate. 顶盖使用透明树脂板的情况与使用玻璃板的情况相比，具有模块可以轻量化的优点。 As compared with the case where the cover glass plate using a transparent resin plate, may have the advantage of lightweight module. 但是，对于以往的透明树脂板，存在由于长期使用而树脂劣化，发生透明性下降导致的发电效率下降的问题。 However, the conventional transparent resin plate, the presence of long-term use and deterioration of resin, the transparency of the power generation efficiency decrease problem leading to a decrease in the occurrence. 由于本发明的成型体具有高耐候性，所以在用作太阳能发电模块用顶盖时，即使长期使用，也没有树脂劣化，也不会出现透明性下降导致的发电效率下降。 Since the molded article of the present invention has high weather resistance, so that when used as a solar power generation module cap, long-term use, there is no deterioration of the resin, the power generation efficiency does not occur due to lowering of transparency decreases. 本发明的太阳能发电模块用顶盖可用于公知的太阳能电池。 The solar power generation module according to the present invention may be used to cover a known solar cell. 以下，利用实施例具体说明本发明，但本发明不限定于这些实施例。  Hereinafter, specific embodiments of the present invention is described using embodiments, but the present invention is not limited to these embodiments. 应予说明，实施例中的"份"和"％"表示"质量份"和"质量％"。 Incidentally, examples, "parts" and "%" embodiment means "parts by mass" and "mass%." 单体（al)的结构的确认使用1H-NMR JNM-EX270(日本电子（株）制，商品名）。  The structure was confirmed monomer (Al) using 1H-NMR JNM-EX270 (JEOL (Co., Ltd.), trade name). 使单体（al)溶解于氘代氯仿，由峰积分强度和峰位置确定化合物。 Monomer (Al) was dissolved in deuterated chloroform, compound is determined from the peak integral intensity and peak position. 测定温度是25°C，积分次数是16次。 Measurement temperature was 25 ° C, to be 16 times integration. 单体的聚合转化率的确认使用1H-NMR JNM-EX270 (日本电子（株）制、商品名）。  confirmed that the polymerization conversion of the monomers using 1H-NMR JNM-EX270 (JEOL (Co., Ltd.), trade name). 在单体（al)和甲基丙烯酸甲酯的共聚中，由归属于来自单体和聚合物的烷氧基的氢、以及归属于来自单体的CC双键的氢的峰的积分比计算聚合转化率。 Comonomer (Al) and methyl methacrylate, the peaks of the integral CC double bond hydrogen by the home alkoxylated monomers and polymers derived from hydrogen, and attributed to the monomer ratio is calculated from polymerization conversion rate. 目视观察成型体，判断着色的有无。  The molded product was visually observed, it is determined whether or colored. Tg使用SII nanotechnology公司制、DSC6220 (商品名）。  Tg using SII nanotechnology Inc., DSC6220 (trade name). 测定是在氮环境下在200°C熔融淬火3分钟，从20°C到250°C以10°C /分升温。 The measurement was quenched under nitrogen in molten 200 ° C 3 min from 20 ° C to 250 ° C at 10 ° C / min temperature increase. 使用GPC (东曹（株）制，HLC_822〇(商品名）、色谱柱：TSK GUARD COLUMN SUPER HZ-L(4. 6X35mm)、TSK-GEL SUPER ΗΖΜ-Ν(6· OX 150mm) X2 串联连接、洗脱液：氯仿、测定温度：40°C、流速：0. 6mL /分），将聚甲基丙烯酸甲酯作为标准进行测定。  Using GPC (Tosoh (K.K. ), HLC_822〇 (trade name), column:. TSK GUARD COLUMN SUPER HZ-L (4 6X35mm), TSK-GEL SUPER ΗΖΜ-Ν (6 · 150mm OX) X2 connected in series, eluent: chloroform, measurement temperature: 40 ° C, flow rate:. 0 6mL / min), a polymethyl methacrylate as a standard was measured. 将成型体切断成40mmX40mm，用中性洗剂清洗表面后，利用metal-weather KU-R5N-A(DAIPLA WINRE S公司制，商品名），以照射强度80mw / cm2、在63°C进行344小时耐候性试验。  The molded body is cut into 40mmX40mm, after cleaning the surface with a neutral detergent, using a metal-weather KU-R5N-A (DAIPLA WINRE S Corporation, trade name), an irradiation intensity of 80mw / cm2, at 63 ° C weather resistance test for 344 hours. 利用分光光度计MCPD-3000(大塚电子（株）制，商品名）测定耐候性试验前后的透射光谱，测定黄色度。 Measurement of transmittance spectra before and after the weather resistance test using a spectrophotometer MCPD-3000 (Otsuka Electronics (Co., Ltd.), trade name), the yellow index was measured. 测定值按照下式根据样品的厚度进行修正。 Correcting the measured value according to the thickness of the sample according to the formula. 另外，求出耐候性试验前后的黄色度（修正值）的差，作为黄色度的"位移"。  Further, obtaining a difference of yellowness before and after the weathering test (the correction value), as yellowness "displaced." 将成型体切断成30mmX30mm，用中性洗剂清洗表面后，利用metal-weather KW-R5TP-A(DAIPLA WINRE S公司制，商品名），以照射强度llOmw / cm2、在65°C保持16小时后，以照射强度Omw / cm2、在65°C保持2小时，之后，水洗试验片表面10秒，以照射强度Omw / cm2、在30°C保持6小时，水洗试验片表面10秒，将以上工序重复18次，进行432小时的耐候性试验。  The molded body is cut into 30mmx30mm, after cleaning the surface with a neutral detergent, using a metal-weather KW-R5TP-A (DAIPLA WINRE S Corporation, trade name), an irradiation intensity llOmw / cm2, at 65 ° C after 16 hours, an irradiation intensity Omw / cm2, held at 65 ° C 2 hours, after washing with water surface of the specimen for 10 seconds at an irradiation intensity Omw / cm2, held at 30 ° C 6 hours, and washed surface of the specimen 10 seconds , the above procedure was repeated 18 times, for 432 hours of weathering test. 利用分光光度计MCPD-3000(大塚电子（株）制、商品名）测定耐候性试验前后的透射光谱，测定黄色度。 Measurement of transmittance spectra before and after the weather resistance test using a spectrophotometer MCPD-3000 (Otsuka Electronics (Co., Ltd.), trade name), the yellow index was measured. 测定值按照下式根据样品的厚度进行修正。 Correcting the measured value according to the thickness of the sample according to the formula. 在0 °C向在四氢呋喃（THF) 200mL中溶解有三乙胺30. 3g (300mmol)和4-羟基-2, 2, 6, 6-四甲基哌啶-N-氧化物（TEMP0L)34. 4g(200mmol)而得的溶液中添加乙酸酐25. 5g(250mmol)。  to 0 ° C and dissolved in 200mL of tetrahydrofuran (THF) triethylamine 30. 3g (300mmol) and 4-hydroxy-2, 2, 6, 6-tetramethylpiperidine-oxide -N- (TEMP0L ) was 34. 4g (200mmol) of acetic anhydride to give 25. 5g (250mmol). 升温至25°C反应12小时后，用旋转蒸发仪浓缩。 After warming to 25 ° C for 12 hours, concentrated on a rotary evaporator. 将残渣投入到1升冰水中，滤取析出的橙色固体，得到4-乙酰基氧-2, 2, 6, 6-四甲基哌啶-N-氧化物33. 8g。 The residue was put into a 1 liter of ice water, the precipitated orange solid was collected by filtration, to give 4-acetyl-oxo-2, 2, 6, 6-tetramethylpiperidine oxide -N- 33. 8g. 将4-乙酰基氧-2, 2, 6, 6-四甲基哌啶-N-氧化物21. 4g(100mmol)溶解在辛烷200mL中，添加氧化钥（VI)O. 9g(6mmol)，加热回流进行脱水。  The 4-acetyl-oxo-2, 2, 6, 6-tetramethylpiperidine oxide -N- 21. 4g (100mmol) dissolved in 200mL octane added key oxide (VI) O. 9g (6mmol), was heated under reflux for dehydration. 一边利用共沸脱水一边花9 小时滴加叔丁基过氧化氢70%水溶液19. 2g(150mm〇l)使其反应。 Flower 9 hours while being t-butyl hydroperoxide was added dropwise 70% aqueous solution of 19. 2g (150mm〇l) a reaction using azeotropic dehydration. 冷却至室温后，慢慢地加入饱和亚硫酸氢钠水溶液30ml，使未反应的过氧化物失活。 After cooling to room temperature, was added slowly 30ml saturated aqueous sodium hydrogen sulfite, unreacted peroxide inactivated. 用旋转蒸发仪浓缩有机层后，将残渣溶解在乙醇lOOmL中，加入6. 7g(150mmol)的氢氧化钾，在25°C反应2小时。 The organic layer was concentrated by a rotary evaporator, the residue was dissolved in ethanol lOOmL added 6. 7g (150mmol) of potassium hydroxide, reaction at 25 ° C 2 hours. 用旋转蒸发仪浓缩混合物，在残渣中加入水200mL，使用总计200mL的二氯甲烷进行萃取。  The mixture was concentrated by a rotary evaporator, the residue was added 200mL of water, and extracted using total 200mL of dichloromethane. 用旋转蒸发仪浓缩有机层后，溶解于二氯甲烷20mL和三乙胺10mL中，在0°C添加甲基丙烯酰氯10. 5g(lOOmmol)，反应1小时。 The organic layer was concentrated by a rotary evaporator, dissolved in 20mL of dichloromethane and 10mL of triethylamine was added methacryloyl chloride 10. 5g (lOOmmol) at 0 ° C, 1 hour. 用旋转蒸发仪浓缩混合物，在残渣中加入水200mL，使用总计200mL的乙酸乙酯进行萃取。 The mixture was concentrated by a rotary evaporator, the residue was added 200mL of water, 200mL of ethyl acetate and extracted in total. 用旋转蒸发仪浓缩有机层，利用柱色谱（硅胶、己烷/乙酸乙酯=20 / 1体积比）精制残渣，得到无色液体26. 3g(收率74. 4%)。 The organic layer was concentrated by a rotary evaporator, by column chromatography (silica gel, hexane / ethyl acetate = 20/1 by volume) to give, to give a colorless liquid 26. 3g (74.4% yield). 利用1H-NMR的测定，确认生成物是单体（al-ι)。  measured by 1H-NMR, it was confirmed that the product was monomer (al-ι). 将单体（al-1)的结构示于下式（4)。  The structures of the monomers (al-1) shown in the following formula (4). 在0 °C向在二氯甲烷100mL中溶解有三乙胺48. 6g(480mmol)和4-羟基-2, 2, 6, 6-四甲基哌啶-N-氧化物（TEMP0L)68. 9g(400mmol)而得的溶液中添加三甲基氯硅烷47.8g(440mmol)。  from 0 ° C was dissolved in methylene chloride to 100mL of triethylamine 48. 6g (480mmol) and 4-hydroxy-2, 2, 6, 6-tetramethylpiperidine oxide -N- (TEMP0L) 68. 9g (400mmol) was added trimethylsilyl chloride 47.8g (440mmol) was obtained. 升温至25°C反应2小时后，用旋转蒸发仪浓缩。 After warming to 25 ° C for 2 hours, concentrated on a rotary evaporator. 在残渣中加入水500ml，使用总计500ml的乙酸乙酯进行萃取。 500ml of water was added to the residue, ethyl acetate was extracted a total of 500ml. 用旋转蒸发仪浓缩有机层，将残渣溶解在己烧中，重结晶得到4-二甲基甲娃烧基氧-2, 2, 6, 6-四甲基哌陡-N-氧化物96. 2g。 The organic layer was concentrated by a rotary evaporator, the residue was dissolved in hexyl burning and recrystallized to give methyl 4-oxo-2-yl burn baby, 2, 6, 6-tetramethylpiperidine steep -N- oxide 96. 2g. 将切削屑状镁4. 6g (190mmol)、脱水THFlOOml、碘10mg加入到反应容器中，用氩置换容器内后，一边将容器内的温度保持在55°C〜65°C -边滴加1-溴丙烷23. 4g(190mmol)， 制备Grignard反应剂。  The shape of magnesium chips 4. 6g (190mmol), dehydration THFlOOml, 10mg of iodine was added to the reaction vessel, the vessel after replacing with argon, while the temperature in the vessel was kept at 55 ° C~65 ° C - side solution of 1-bromopropane 23. 4g (190mmol), prepare a Grignard reagent. 在另一反应容器中，将4-三甲基甲硅烷基氧-2, 2, 6, 6-四甲基哌啶-N-氧化物96. 2g(394mmol)溶解在脱水THFlOOml中，在0°C滴加制备的Grignard反应剂。  In another reaction vessel, 4-trimethyl silyl-oxo-2, 2, 6, 6-tetramethylpiperidine oxide -N- 96. 2g (394mmol) was dissolved in the dehydrated THFlOOml , Grignard reagent prepared was added dropwise at 0 ° C. 反应3小时后，用旋转蒸发仪浓缩溶液。 After 3 hours, the solution was concentrated using a rotary evaporator. 在残渣中加入500ml的水，用总计500ml的乙酸乙酯萃取， 用旋转蒸发仪浓缩有机层。 To the residue was added 500ml of water, 500ml of the total extracted with ethyl acetate, the organic layer was concentrated on a rotary evaporator. 利用柱色谱（硅胶、己烷/乙酸乙酯=20 / 1体积比））精制残渣，得到1-(1-丙基）氧-2, 2, 6, 6-四甲基-4-三甲基甲硅烷基氧哌啶38. 5g。 By column chromatography (silica gel, hexane / ethyl acetate = 20/1 by volume)) The residue was purified to give 1- (1-propyl) oxy -2, 2, 6, 6-tetramethyl-4-trimethoxyphenyl silyl Oxypiperidine 38. 5g. 将1-(1-丙基）氧_2, 2, 6, 6-四甲基-4-三甲基甲硅烷基氧哌啶38. 5g溶解在甲醇300ml中，加入碳酸钾0. 14g(0. lmmol)反应3小时后，用旋转蒸发仪浓缩溶液。  1- (1-propyl) oxy _2, 2, 6, 6-tetramethyl-4-yloxy trimethylsilyl piperidine 38. 5g dissolved in methanol 300ml, potassium carbonate 0 after. 14g (0. lmmol) for 3 hours, the solution was concentrated on a rotary evaporator. 在残渣中加入水300ml，用总计300ml的乙酸乙酯进行萃取。 300ml of water was added to the residue, extracted with ethyl acetate 300ml in total. 用旋转蒸发仪浓缩有机层，将残渣溶解在二氯甲烷20ml、三乙胺20ml中，在0°C滴加甲基丙烯酰氯14. lg(135mmol)。 The organic layer was concentrated by a rotary evaporator, the residue was dissolved in dichloromethane 20ml, 20ml of triethylamine, 0 ° C and added dropwise of methacryloyl chloride 14. lg (135mmol). 反应1小时后，过滤掉析出的三乙胺盐酸盐，用旋转蒸发仪浓缩溶液。 After one hour reaction, triethylamine hydrochloride was filtered off precipitate and the solution was concentrated using a rotary evaporator. 利用柱色谱（硅胶、己烷/乙酸乙酯=20 / 1体积比）精制残渣，得到无色的液体29. 7g(收率26. 2%)。 By column chromatography (silica gel, hexane / ethyl acetate = 20/1 by volume) to give to give a colorless liquid 29. 7g (26.2% yield). 利用1H-NMR的测定，确认生成物是单体（al-2)。  measured by 1H-NMR, it was confirmed that the product was monomer (al-2). 将单体（al-2)的结构示于下式（8)。  The structures of the monomers (al-2) shown in the following formula (8). 在0 °C向在THFlOOmL中溶解有三乙胺20. 2g(200mmol)和2, 2, 6, 6-四甲基-4-(2-(2-轻基）乙氧基）乙氧基脈陡-1^-氧化物26.(^(10〇1111]1〇1)而得的溶液中添加乙酸酐12. 3g(120mm〇l)。升温至25°C反应12小时后，用旋转蒸发仪浓缩。在残渣中加入水500ml，用总计500ml的乙酸乙酯进行萃取。用旋转蒸发仪浓缩有机层后，利用柱色谱（硅胶、己烷/乙酸乙酯=1 / 1体积比）精制残渣，得到2, 2, 6, 6-四甲基-4-(2-(2-乙酰基氧）乙氧基）乙氧基哌陡-N-氧化物5.6g(22mmol)。  from 0 ° C to dissolve triethylamine 20. 2g (200mmol) in THFlOOmL and 2, 2, 6, 6-tetramethyl-4- (2- (2-light-yl) ethoxy) ethyl oxide was added 26 (^ (10〇1111] 1〇1) was obtained by acetic anhydride 12. 3g (120mm〇l) after heating 25 ° C for 12 hours to, - ^ -1 steep pulse group. concentrated on a rotary evaporator. to the residue was added 500ml of water, extracted with ethyl acetate 500ml in total. after the organic layer was concentrated by a rotary evaporator, by column chromatography (silica gel, hexane / ethyl acetate = 1/1 volume ratio ) to give to give 2, 2, 6, 6-tetramethyl-4- (2- (2-acetyl-yloxy) ethoxy) ethoxy steep -N- piperidin-oxide 5.6g (22mmol). 将2, 2, 6, 6-四甲基-4-(2-(2-乙酰基氧）乙氧基）乙氧基哌啶-N-氧化物3. Og(lOmmol)溶解在辛烷100mL中，加入氧化钥（VI)0. 07g(0. 5mmol)，加热回流进行脱水。  The 2, 2, 6, 6-tetramethyl-4- (2- (2-acetyl-yloxy) ethoxy) ethoxy -N- piperidin-oxide 3. Og (lOmmol) was dissolved in octane 100mL added key oxide (VI) 0. 07g (0. 5mmol), was heated under reflux for dehydration. 一边利用共沸脱水一边花6小时滴加叔丁基过氧化氢70%水溶液12. 8g(100mmol)使其反应。 Flower 6 hours while being added dropwise t-butyl hydroperoxide 70% aqueous solution of 12. 8g (100mmol) was reacted using azeotropic dehydration. 冷却至室温后，慢慢地加入饱和亚硫酸氢钠水溶液20ml,使未反应的过氧化物失活。 After cooling to room temperature, was slowly added 20ml of saturated aqueous sodium hydrogen sulfite, unreacted peroxide inactivated. 用旋转蒸发仪浓缩有机层后，将残渔溶解在乙醇15mL中，加入0. 6g(15mmol)的氢氧化钠，在25°C反应2小时。 The organic layer was concentrated by a rotary evaporator, the residue dissolved in ethanol 15mL fishing added 0. 6g (15mmol) of sodium hydroxide was reacted at 25 ° C 2 hours. 用旋转蒸发仪浓缩混合物，在残渣中加入水100mL，用总计100mL的二氯甲烷进行萃取。  The mixture was concentrated by a rotary evaporator, the residue was added 100mL of water, extracted with a total of 100mL of dichloromethane. 用旋转蒸发仪浓缩有机层后，溶解在三乙胺10mL中，在0°C添加甲基丙烯酰氯1. lg(lOmmol)，反应1小时。 The organic layer was concentrated by a rotary evaporator, dissolved in 10mL of triethylamine was added methacryloyl chloride 1. lg (lOmmol) at 0 ° C, 1 hour. 用旋转蒸发仪浓缩混合物，在残渔中加入水50mL，使用总计50mL的乙酸乙酯进行萃取。 The mixture was concentrated by a rotary evaporator, the residue was added 50mL of water fishing, a total of 50mL of ethyl acetate and extracted. 用旋转蒸发仪浓缩有机层，利用柱色谱（硅胶、己烷/乙酸乙酯=3 / 1体积比）精制残渔，得到无色的液体1. 9g(3. lmmol)(收率3. 1%)。 The organic layer was concentrated by a rotary evaporator, by column chromatography (silica gel, hexane / ethyl acetate = 3/1 by volume) fishing residue was purified to give a colorless liquid 1. 9g (3. Lmmol) (Yield 3.1 %). 利用1H-NMR的测定，确认生成物是单体（al-3)。  measured by 1H-NMR, it was confirmed that the product was monomer (al-3). 将单体（al-3)的结构示于下式（9)。  The structure of the monomer (al-3) shown in the following formula (9). 将合成例1记载的方法所合成的4-乙酰基氧-2, 2, 6, 6-四甲基哌啶-N-氧化物6. 4g(30mmol)溶解在辛烷100mL中，加入氧化钥（VI)0. lg(0. 7mmol)，加热回流进行脱水。  The method described in Synthesis Example 1 Synthesis of the 4-acetyl-oxo-2, 2, 6, 6-tetramethylpiperidine oxide -N- 6. 4g (30mmol) dissolved in 100mL of octane, key oxide was added (VI) 0. lg (0. 7mmol), was heated under reflux for dehydration. 一边利用共沸脱水一边花6小时滴加叔丁基过氧化氢70%水溶液12. 8g(100mmol)使其反应。 Flower 6 hours while being added dropwise t-butyl hydroperoxide 70% aqueous solution of 12. 8g (100mmol) was reacted using azeotropic dehydration. 冷却至室温后，慢慢地加入饱和亚硫酸氢钠水溶液50ml,使未反应的过氧化物失活。 After cooling to room temperature, was slowly added 50ml of saturated aqueous sodium hydrogen sulfite, unreacted peroxide inactivated. 用旋转蒸发仪浓缩有机层后，将残渣溶解在乙醇50mL中，加入2. 8g(50mmol)的氢氧化钾，在25°C反应4小时。 The organic layer was concentrated by a rotary evaporator, the residue was dissolved in 50mL of ethanol was added 2. 8g (50mmol) potassium hydroxide, the reaction in 25 ° C 4 hours. 用旋转蒸发仪浓缩混合物，在残渣中加入水100mL，用总计100mL的二氯甲烷进行萃取。  The mixture was concentrated by a rotary evaporator, the residue was added 100mL of water, extracted with a total of 100mL of dichloromethane. 用旋转蒸发仪浓缩有机层。 The organic layer was concentrated by a rotary evaporator. 在残渔中加入四氢呋喃20ml、三乙胺4. 0g(40mmol)、琥珀酸酐3. 0g(30mmol)，在70°C持续搅拌4小时。 20ml of tetrahydrofuran was added at residues fishing in, succinic anhydride (30mmol), stirred for 4 hours, triethylamine 4. 0g (40mmol) 3. 0g continued at 70 ° C. 4小时后，用旋转蒸发仪浓缩，在残渣中加入饱和氯化铵水溶液l〇〇ml，用总计100ml的乙酸乙酯进行萃取。 After 4 hours, was concentrated by a rotary evaporator, l〇〇ml saturated aqueous ammonium chloride was added to the residue, extracted with ethyl acetate 100ml in total. 用旋转蒸发仪浓缩有机层，在残渣中加入甲基丙烯酸2-羟基乙酯3. 9g(30mmol)、 Ν，Ν' -二甲基-4-氨基吡啶0. 24g (2mmo 1)、二氯甲烷5ml，在0°C滴加将Ν，Ν' -二环己基碳二亚胺6. 2g(30mmol)溶解在二氯甲烷20ml中而得的溶液，反应4小时。  The organic layer was concentrated by a rotary evaporator, methyl acrylate, 2-hydroxyethyl methacrylate 3. 9g (30mmol) to the residue, Ν, Ν '- dimethyl-4-aminopyridine 0. 24g (2mmo 1) , dichloromethane 5ml, 0 ° C and added dropwise to Ν, Ν '- dicyclohexyl carbodiimide 6. 2g (30mmol) was dissolved in dichloromethane 20ml obtained solution, a reaction for 4 hours. 4小时后，过滤掉析出的固体，用旋转蒸发仪浓缩滤液。 After 4 hours, the precipitated solid was filtered off, the filtrate was concentrated by rotary evaporation. 利用柱色谱（硅胶、己烷/乙酸乙酯=5 / 1体积比） 精制残渣，得到无色的液体5. 58g (收率56. 1%)。 By column chromatography (silica gel, hexane / ethyl acetate = 5/1, volume ratio) to give to give a colorless liquid 5. 58g (56.1% yield). 利用1H-NMR的测定，确认生成物是单体（al-4)。  measured by 1H-NMR, it was confirmed that the product was monomer (al-4). 将单体（al-4)的结构示于下式（10)。  The structure of the monomer (al-4) shown in the following formula (10). 将2, 2, 6, 6-四甲基-4-羟基哌啶-N-氧化物17. 8g(100mmol)溶解在丙酮100ml 中，花10分钟以上慢慢添加30%双氧水溶液34g(300mmol)。  The 2, 2, 6, 6-tetramethyl-4-hydroxypiperidine -N- oxide 17. 8g (100mmol) was dissolved in 100ml of acetone, to spend more than 10 minutes was slowly added a solution of 30% hydrogen peroxide 34g (300mmol). 一边冷却至5°C-边添加氯化铜（I) 0. 49g(5. Omol%)，将反应混合物的温度保持在5°C至55°C之间。 Was cooled to 5 ° C- while adding copper (I) chloride, 0. 49g (5. Omol%), the reaction mixture temperature was maintained between 5 ° C to 55 ° C. 15分钟后，添加35% 盐酸〇.5g，在室温搅拌反应混合物2小时。 After 15 minutes, 35% hydrochloric acid 〇.5g, the reaction mixture was stirred at room temperature for 2 hours. 2小时后，加入4mol / L的亚硫酸氢钠水溶液50ml、饱和碳酸氢钾水溶液100ml，用300ml的乙酸乙酯进行萃取。 After 2 hours, was added 4mol / L aqueous solution of sodium bisulfite 50ml, saturated aqueous potassium bicarbonate 100ml, 300ml is extracted with ethyl acetate. 用旋转蒸发仪浓缩有机层，得到1-甲基氧-2, 2, 6, 6-四甲基-4-羟基哌啶。 The organic layer was concentrated by a rotary evaporator to give 1-methyl-oxo-2, 2, 6, 6-tetramethyl-4-hydroxypiperidine. 将得到的1-甲基氧-2, 2, 6, 6-四甲基-4-羟基哌啶溶解在二氯甲烷50ml、三乙胺50ml中，在0°C慢慢添加甲基丙烯酰氯10. 4g(100mmol)。  The resulting 1-methyl-oxo-2, 2, 6, 6-tetramethyl-4-hydroxypiperidine were dissolved in 50ml of dichloromethane, 50ml of triethylamine, between 0 ° C was slowly added methanesulfonyl yl acryloyl chloride 10. 4g (100mmol). 一边慢慢地升温至室温一边反应1小时。 It was slowly warmed to room temperature while 1 hour. 1小时后，用旋转蒸发仪浓缩反应混合物，在残渣中加入水300ml，用乙酸乙酯300ml 进行萃取。 After 1 hour, the reaction mixture was concentrated by a rotary evaporator, the residue was added 300ml of water, extracted with ethyl acetate 300ml. 用旋转蒸发仪浓缩有机层，利用柱色谱（硅胶、己烷/乙酸乙酯=10 / 1体积比）精制残渣，得到无色的液体19. 0g (收率74. 3%)。 The organic layer was concentrated by a rotary evaporator, by column chromatography (silica gel, hexane / ethyl acetate = 10/1 by volume) to give to give a colorless liquid 19. 0g (yield 74.3%). 利用1H-NMR的测定，确认生成物是单体（al-5)。  measured by 1H-NMR, it was confirmed that the product was monomer (al-5). 将单体（al-5)的结构示于下式（11)。  The structures of the monomers (al-5) shown in the following formula (11). 将用合成例1记载的方法合成的4-乙酰基氧-2, 2, 6, 6-四甲基哌啶-N-氧化物4. 3g(20mmol)溶解在异丙苯200ml中，慢慢添加叔丁基过氧化物11. 7g(80mmol)。  The method described in Synthesis Example 1 Synthesis of 4-acetyl-oxo-2, 2, 6, 6-tetramethylpiperidine oxide -N- 4. 3g (20mmol) was dissolved in 200ml of cumene , tert-butyl peroxide was slowly added 11. 7g (80mmol). 氮鼓泡30分钟后，移至Heraeus公司制UV理化学反应装置（Systeml)。 After 30 minutes nitrogen bubbling, Heraeus Corporation moved to the chemical reaction UV processor means (Systeml). 用TQ150型灯进行10分钟光照射使其反应。 Light irradiation for 10 minutes with the reaction TQ150 lamp. 用旋转蒸发仪浓缩反应混合物，利用柱色谱（硅胶、己烷/乙酸乙酯= 5 / 1体积比）精制残渣，得到1-枯基氧-2, 2, 6, 6-四甲基-4-乙酰基氧哌啶5. 5g (收率82. 3%)。 The reaction mixture was concentrated on a rotary evaporator, by column chromatography (silica gel, hexane / ethyl acetate = 5/1, volume ratio) to give to give 1- cumyl-oxo-2, 2, 6, 6-tetramethyl-4 - acetyl Oxypiperidine 5. 5g (yield 82.3%). 利用1H-NMR的测定，确认生成物是单体（al-6)。  measured by 1H-NMR, it was confirmed that the product was monomer (al-6). 将单体（al-6)的结构示于下式（12)。  The structures of the monomers (al-6) shown in the following formula (12). 将单体（al_l) 17. 7g(50mmol)、甲基丙稀酸甲醋（MMA)45. lg(450mmol)、辛基硫醇0. 6g、2, 2' -偶氮双异丁腈0. 3g溶解在甲苯200ml中，在75°C在氮环境下聚合4小时。 . The monomer (al_l) 17. 7g (50mmol), methyl acrylic acid methyl ester (MMA) 45 lg (450mmol), octyl mercaptan 0. 6g, 2, 2 '- azobisisobutyronitrile 0. 3g nitrile was dissolved in toluene 200ml, the polymerization under nitrogen atmosphere at 75 ° C 4 hours. 用甲醇再沉淀得到的聚合物溶液，在85°C减压干燥，得到聚合物（b-Ι)。 Polymer solution obtained was reprecipitated with methanol, dried at 85 ° C under reduced pressure to obtain a polymer (b-Ι). 聚合物（b-Ι)的Mnl. 68 万、PDI 1.44,收量35. 7g (收率56. 9%)。 Polymer (b-Ι) of Mnl. 68 million, PDI 1.44, Yield 35. 7g (56.9% yield). 将单体（al-2) 12. 8g(50mmol)、ΜΜΑ45· lg(450mmol)、辛基硫醇0· 6g、2, 2' -偶氮双异丁腈〇.3g溶解在甲苯200ml中，在75°C在氮环境下聚合4小时。  The monomer (al-2) 12. 8g (50mmol), ΜΜΑ45 · lg (450mmol), octyl mercaptan 0 · 6g, 2, 2 '- azobisisobutyronitrile were dissolved in toluene 〇.3g 200ml, the polymerization under nitrogen atmosphere for 4 hours at 75 ° C. 在甲醇中再沉淀得到的聚合物溶液，在85°C减压干燥，得到聚合物（b-2)。 Reprecipitated in methanol, the polymer solution obtained was dried at 85 ° C under reduced pressure to obtain a polymer (b-2). 聚合物（b-2)的Mnl. 89万，PDI 1.39， 收量27. 7g (收率47. 9%)。 Polymer (b-2) a Mnl. 89 million, PDI 1.39, Yield 27. 7g (47.9% yield). 将单体（al-2)7. 7g(30mmol)、MMA27. 0g(270mmol)、辛基硫醇0· 6g、2, 2' -偶氮双异丁腈〇. 16g溶解在甲苯100ml中，在75°C在氮环境下聚合4小时。  The monomer (al-2) 7 7g (30mmol), MMA27 0g (270mmol), octyl mercaptan 0 · 6g, 2, 2 '-... Azobisisobutyronitrile dissolved in 16g of toluene billion 100ml, the polymerization under nitrogen atmosphere for 4 hours at 75 ° C. 在甲醇中再沉淀得到的聚合物溶液，在85°C减压干燥，得到聚合物（b-3)。 Reprecipitated in methanol, the polymer solution obtained was dried at 85 ° C under reduced pressure to obtain a polymer (b-3). 聚合物（b-3)的MnO. 83万，PDI 1. 66， 收量22. lg (收率63. 8%)。 Polymer (b-3) of MnO. 83 million, PDI 1. 66, Yield 22. lg (63.8% yield). 将单体（al-2)7. 7g(30mmol)、MMA27. 0g(270mmol)、辛基硫醇1. 5g、2, 2' -偶氮双异丁腈〇. 16g溶解在甲苯100ml中，在75°C在氮环境下聚合4小时。  The monomer (al-2) 7 7g (30mmol), MMA27 0g (270mmol), octyl mercaptan 1. 5g, 2, 2 '-... Azobisisobutyronitrile dissolved in 16g of toluene billion 100ml, the polymerization under nitrogen atmosphere for 4 hours at 75 ° C. 在甲醇中再沉淀得到的聚合物溶液，在85°C减压干燥，得到聚合物（b-4)。 Reprecipitated in methanol, the polymer solution obtained was dried at 85 ° C under reduced pressure to obtain a polymer (b-4). 聚合物（b-4)的MnO. 52万，PDI 1. 42， 收量19. 8g (收率57. 1%)。 Polymer (b-4) of MnO. 52 million, PDI 1. 42, yield 19. 8g (57.1% yield). 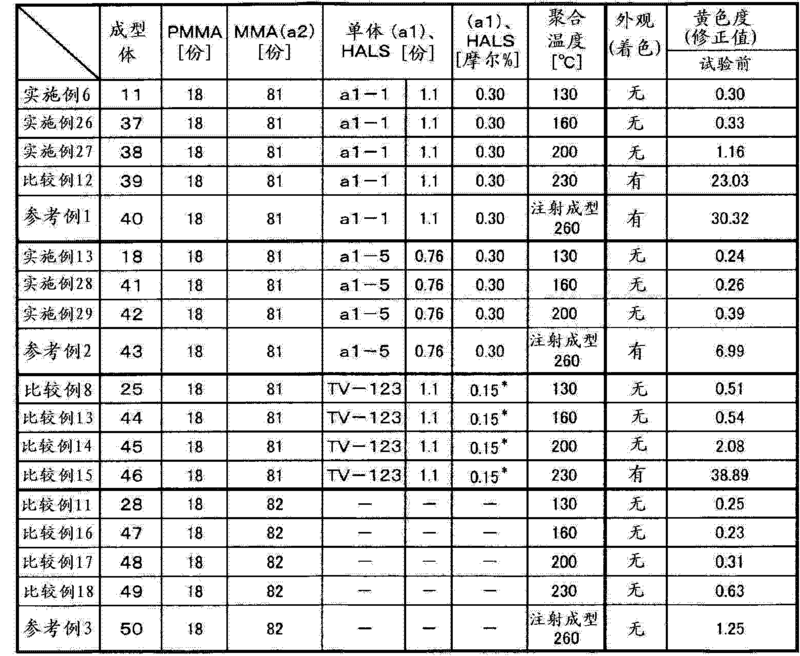 以表1记载的比例混合MMA、单体（al)，得到单体混合物。  In the mixing ratio described in Table 1 MMA, the monomer (al), to give a monomer mixture. 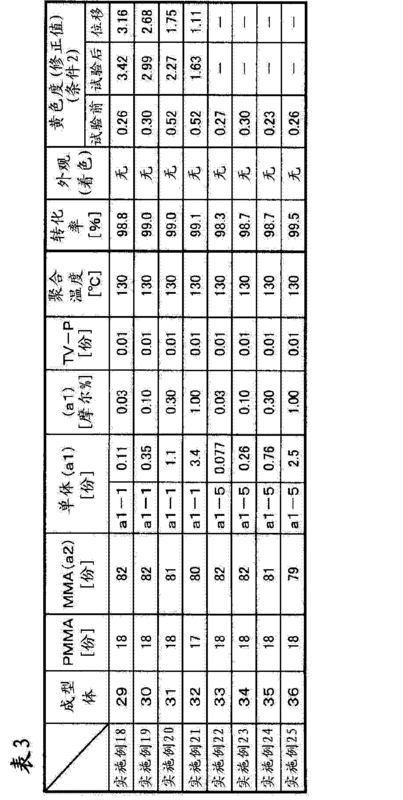 将单体混合物中的单体(al)的含有率（摩尔％)示于表1。 The monomer mixture of monomers (Al) content (mol%) shown in Table 1. 在单体混合物中添加叔己基过氧化特戊酸酯0.35份作为聚合引发剂，添加磺基琥珀酸二（2-乙基己基）酯钠0.015份作为脱模剂。 Tert-hexyl peroxy pivalate 0.35 parts of the monomer mixture as a polymerization initiator was added sulfosuccinic acid di (2-ethylhexyl) phosphate 0.015 parts of a release agent. 将该混合物减压脱气后，注入介由聚氯乙烯制密封垫以1. 2mm的间隔相对的2枚强化玻璃板形成的模中。 After the mixture was degassed under reduced pressure, the seal via injection molding polyvinyl chloride in a two pad strengthened glass sheet 1. 2mm spaced opposed formed. 将模浸渍在80°C的温水中30分钟，进行第1步聚合，在130°C的空气加热炉中热处理30分钟，进行第2步的聚合。  The mold was immersed in warm water to 80 ° C for 30 minutes to carry out polymerization step, a heat treatment in an air oven 130 ° C for 30 minutes, a second polymerization step. 冷却至80°C后，将模框脱去而得到板厚1. 0±0. 2mm的成型体（1)〜（3)。 After cooling to 80 ° C, the mold frame removed to obtain a molded sheet thickness (1) ~ (3) 1. 0 ± 0. 2mm in. 将成型体（1)〜（3)的聚合转化率、外观、基于耐候性试验（条件1)的黄色度示于表1。 The polymerization conversion ratio  The molded product (1) to (3), appearance, weather resistance test based on (Condition 1) yellowness index is shown in Table 1. 应予说明，实施例3不实施耐候性试验。 Incidentally, in Example Embodiment 3 is not weathering test. 不使用单体（al)而使用表1所示的HALS，除此以外，与实施例1同样地得到成型体（4)〜（8)。  without the use of monomers (Al) used HALS shown in Table 1, except that, in the same manner as in Example obtain a molded body (4) to (8) 1. 将成型体（4)〜（8)的聚合转化率、外观、基于耐候性试验（条件1)的黄色度不于表1。 The polymerization conversion of the molded body (4) to (8), appearance, weather resistance test based on (Condition 1) of not yellow in Table 1. * LS-770、TV-292因为分子内具备2个具有哌啶骨架的受阻胺结构（以下，称为"HALS部位"），所以作为HALS部位添加0. 10摩尔％。  * LS-770, TV-292 because the structure includes two hindered amine having a piperidine skeleton in the molecule (hereinafter referred to as "HALS site"), so as to add 0.10 parts of HALS mol%. 使用表2和表3表示的各原料，使强化玻璃板的间隔为3. 6mm，使叔己基过氧化特戊酸酯的量为〇. 19份，除此以外，与实施例1同样地得到板厚3. 0±0. 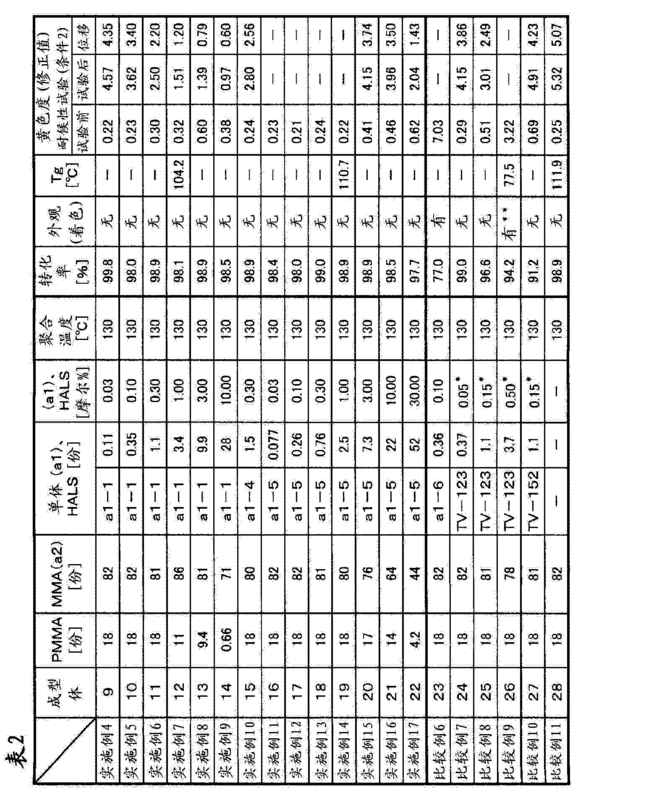 2_的成型体（9)〜 (36)。 Each raw material  Table 2 and Table 3 shows, the strengthened glass sheet interval 3. 6mm, so that the amount of peroxide t-hexylperoxy pivalate is square. 19 parts, except that in Example 1 Likewise the thickness obtained molded body (9) ~ (36) 3. 0 ± 0. 2_ is. 将成型体（9)〜（36)的聚合转化率、外观、Tg、基于耐候性试验（条件2)的黄色度示于表2和表3。 The polymerization conversion ratio  The molded body (9) to (36), appearance, a Tg of, based on the weathering test (condition 2) a yellowness index shown in Table 2 and Table 3. 应予说明，未显示Tg和耐候性试验的结果的地方是未测定。 Incidentally, not shown in the results of the local weather resistance test and Tg is not determined. * TV-123, TV-152由于分子内具备2个HALS部位，所以HALS部位的摩尔数是添加摩尔数的2倍。  * TV-123, TV-152 HALS includes two parts because the molecule, the number of moles of HALS portion is 2 times the number of moles added. * *成型体26除了着色，还发现浑浊（比较例9)。  * * 26 A colored molded article, haze was also found (Comparative Example 9). 使用表4所示的各原料，替换第2步的聚合温度130°CX 30分钟，设为表4记载的聚合温度X30分钟，除此以外，与实施例4同样地得到成型体。  Table 4 shows the respective raw materials, replacing in step 2 of the polymerization temperature of 130 ° CX ​​30 minutes, the polymerization temperature is set forth in Table 4 minutes X30, except that in Example 4 to obtain a molded body. 利用分光光度计MCPD_3000(大塚电子（株）制、商品名）测定得到的成型体的透射光谱，测定黄色度。  using a spectrophotometer MCPD_3000 (Otsuka Electronics (Co., Ltd.), trade name) was measured transmission spectra of the obtained molded article, the yellowness index was measured. 测定值按照下式根据样品的厚度进行修正。 Correcting the measured value according to the thickness of the sample according to the formula. 将成型体的外观、黄色度示于表4。  The appearance, yellowness molded body are shown in Table 4. 混合表4所示的各原料，得到混合体。  each of the raw materials shown in Table 4 were mixed to obtain a mixture. 在混合体中添加叔己基过氧化特戊酸酯〇. 35份作为聚合引发剂。 Tert-hexyl peroxy pivalate billion in the mixture 35 parts of a polymerization initiator. 将其投入玻璃性容器中，减压脱气后，将容器内氮置换，在80°C加热2小时进行聚合。 To put it into a glass container, degassed under reduced pressure, the inner vessel was purged with nitrogen, heated at 80 ° C 2 hours of polymerization. 适当切断得到的聚合物后，供给到小型注射成型机CS-183-MMX(Custom Scientific Instruments公司制），在料筒温度260 °C的条件下保持10分钟后，使用10mm X 20mm X 2mm的模具，在模具温度60 Ό注射成型，制成成型体。 After cutting the appropriate polymer obtained, is supplied to a small injection molding machine CS-183-MMX (Custom Scientific Instruments Inc.), maintained for 10 minutes at a cylinder temperature of 260 ° C, using 10mm X 20mm X 2mm die , at a mold temperature of 60 Ό injection-molded to obtain a molded body. 与实施例26同样地测定得到的成型体的透射光谱，求出黄色度（修正值）。  26 and transmission spectra measured in the same manner the molded body obtained in Example, to obtain the degree of yellow (correction value). 在参考例1〜3中，根据修正，求出相当于成型体的板厚3mm时的黄色度。 In reference example 1~3, based on the correction, corresponding to yellow is obtained when the thickness of the molded body 3mm. 将注射成型所制成的成型体的外观、黄色度示于表4。  appearance of the molded body made of injection molded, yellowness index is shown in Table 4. * TV-123由于分子内具备2个HALS部位，所以添加0.30摩尔％作为HALS部位。  * TV-123 HALS includes two parts because the molecule, so as to add 0.30 mole% HALS site. 使用表5所不的各原料，与实施例4同样地得到板厚3. 0±0. 2mm的成型体（51)〜 (58)。  Table 5 using the respective raw materials are not, in the same manner as in Example 4 to obtain a thickness of the molded body 3. 0 ± 0. 2mm (51) - (58). 与实施例26同样度测定得到的成型体的透射光谱，求出黄色度（修正值）。  Example 26 of the same measured transmission spectrum obtained molded body obtained yellowness (correction value). 将成型体（51)〜（58)的聚合转化率、外观、黄色度示于表5。 The polymerization conversion ratio  The molded body (51) through (58), appearance, yellowness index is shown in Table 5. 从表1〜5可知，本发明的制造方法所得到的成型体的黄色度低，外观良好。  As apparent from Table 1 ~ 5, low yellow index molded body manufacturing method according to the present invention obtained good appearance. 另一方面，在大于210°C的温度聚合而成的成型体中，使用单体（al)的成型体的黄色度高，夕卜观不良（比较例12)。 On the other hand, at temperatures greater than 210 ° C the polymerization of the molded body, a molded body high yellow monomers (Al) and poor outlook Bu Xi (Comparative Example 12). 在大于210°C的温度注射成型而得的成型体中，使用单体（al)的成型体的黄色度高，外观不良（参考例1、2)。 At temperatures greater than 210 ° C of the molded article obtained by injection molding, a molded body high yellow monomers (Al) and poor appearance (Reference Examples 1 and 2). 使用与本发明的单体（al)不同的结构的单体(al-6)的成型体即使聚合温度是130°C，成型体的黄色度也高，外观也不良（比较例6)。 Using the monomers of the invention (Al) different monomers (al-6) of the molded structure, even if the polymerization temperature is 130 ° C, the yellow of the molded article is high, appearance is poor (Comparative Example 6). 从表1〜3可知，本发明的制造方法所得到的成型体在耐候性试验前后的黄色度的位移小，显示良好的耐候性。  As apparent from Table 1 ~ 3, a yellow small displacements of the manufacturing method of the molded article obtained according to the present invention before and after the weather resistance test, shows good weather resistance. 另一方面，不使用单体（al)的在耐侯性试验前后的黄色度的位移大，耐侯性不良（比较例1〜5、7、8、10、11)。 On the other hand, without using monomers (Al) displacement of yellowness before and after the weather resistance test large, poor weather resistance (Comparative Example 1~5,7,8,10,11). 从表2可知，使用作为非聚合性的N0R-HALS的TV-123或TV152的成型体（比较例7、8、10)与使用作为聚合性N0R-HALS的单体（al)的成型体中含有相同摩尔量HALS部位的成型体（实施例5、6)相比，在耐候性试验前后的黄色度的位移大，耐候性不良。  From Table 2, used as a non-polymerizable N0R-HALS of TV-123 or shaped bodies (Comparative Examples 7,8,10) TV152 with a polymerizable monomer as a N0R-HALS (Al) of HALS same molar amount of the molded portion molded body contained (Examples 5 and 6) compared to the large displacement of yellowness before and after the weather resistance test, poor weather resistance. 从表2可知，本发明的制造方法所得到的成型体（实施例7、14)与含有作为非聚合性的N0R-HALS的TV123的成型体（比较例9)相比，Tg的下降少，耐热性良好。  From Table 2, the manufacturing method of the present invention, the obtained molded product (Example 7, 14) containing a non-polymerizable as compared N0R-HALS molded article (Comparative Example 9) TV123 is, a Tg of the less decline in heat resistance. 本发明的制造方法可以在不发生聚合性N0R-HALS的分解导致的着色的情况下制造耐候性优异、其效果不经时下降的成型体。 Manufacturing a case where excellent weathering resistance  The production method of the present invention may not decompose colored polymerizable N0R-HALS results in the occurrence, decrease its effect without the forming body. 本发明所制造的成型体作为建材等室外使用的物品有用，尤其作为太阳能发电模块用顶盖有用。 The present invention is manufactured as a molded article is useful in building materials used outdoors, in particular for use as a solar photovoltaic module useful in the cap. 式⑶中，η表示1〜10的整数。 ⑶ the formula, η represents an integer of 1~10. 4. 如权利要求1所述的聚合物的制造方法，其中，单体混合物的聚合是浇铸聚合。 The method for producing the polymer as claimed in claim 1, wherein the polymerizable monomer mixture is cast polymerization. 5. 如权利要求2或3所述的聚合物的制造方法，其中，混合物的聚合是浇铸聚合。 The method for producing a polymer of 2 or claim 3, wherein the polymerization mixture is cast polymerization. 6. -种成型体，其特征在于，由权利要求4所述的制造方法得到。 6. - kind of molded body, characterized by the manufacturing method according to claim 4 obtained. 7. -种成型体，其特征在于，由权利要求5所述的制造方法得到。 7. - kind of molded body, characterized by the manufacturing method according to claim 5 obtained. 8. -种太阳能发电模块用顶盖，其特征在于，使用了权利要求6所述的成型体。 8. - kind of solar power generation module cover, characterized in that, using the molded body according to claim 6. 9. 一种太阳能发电模块用顶盖，其特征在于，使用了权利要求7所述的成型体。 A solar power generation module cover, characterized in that, using the molded body according to claim 7. DE3852742T3 (en) 1987-09-21 2005-02-10 Ciba Speciality Chemicals Holding Inc. N-substituted hindered amine stabilizers.